Make the most of a day trip to Kangaroo Island on a full-day guided tour that takes in the highlights of this unspoiled natural paradise. Visit Seal Bay Conservation Park, Vivonne Bay, Flinders Chase National Park, Remarkable Rocks and Admirals Arch among other spots to see native animals including koalas, kangaroos, wallabies, goannas, echidnas, long-nosed fur seals and more. Choose to travel by coach and ferry or by air to reach Kangaroo Island for a truly exceptional Australian wildlife experience. 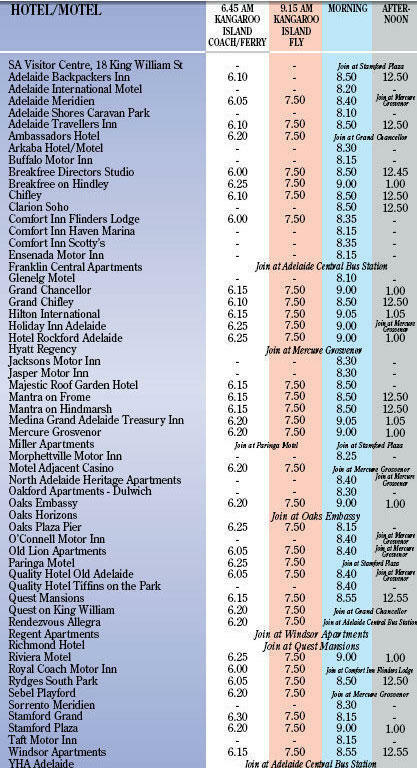 It's the best option for a comprehensive day trip to the island from Adelaide.Please note: Effective from May 3, 2018, due to roadworks on Frome Street, the temporary pick-up location for guests staying at the Majestic Roof Garden Hotel and Mantra on Frome will be 16, Hindmarsh Square, Adelaide. After early morning pickup from your Adelaide or Glenelg hotel, meet your guide and relax aboard a comfortable air-conditioned coach on the scenic 90-minute journey over the Fleurieu Peninsula to Cape Jervis. Then enjoy a 45-minute ferry ride across the Backstairs Passage to Kangaroo Island where you transfer to a luxury coach for your island tour. If you choose to fly to Kangaroo Island, your coach meets you at the Kingscote Airport.Take in the scenery as you drive to Seal Bay Conservation Park where Australian sea lions sunbathe and frolic on a stunning beach. Meet a National Parks Ranger for a guided walk on the beach and get a close look at the sea lion colony. Leave the sea lions and head to gorgeous Vivonne Bay for a delicious 2-course lunch at Vivonne Bay Bistro. Large windows and a sun deck allow you to look for critters like kangaroos and koalas in the native bush that surrounds the building. See more wildlife after lunch when you stop at Hanson Bay Wildlife Sanctuary. Koalas lounge in the eucalyptus groves and echidnas, kangaroos and wallabies roam free on the large predator-free property. Then continue to the rugged southern coast of Flinders Chase National Park for a walk among the giant granite boulders called Remarkable Rocks. Snap photos of a natural rock archway named Admirals Arch, gaze over the Cape Du Couedic coastline and observe the antics of long-nosed fur seals as they play and laze about on the rocks. Throughout the day, your expert guide shares facts about the wildlife and history of the island. After a day exploring the natural beauty of Kangaroo Island, return to Penneshaw or Kingscote Airport, keeping your eyes peeled for more kangaroo and wallaby sightings. Then travel by air or ferry and coach back to Adelaide where your tour ends.